November 8 in the Crimea, the homes of Crimean Tatars were searched again, after which several people were detained, and their phones or laptops were seized, according to the report by activists of the Crimean solidarity. Thus, in the morning the security forces conducted a search in Bakhchysarai in the house of the civil activist Seitumer Velievich Seitumerov. Seitumerov is a local photographer, economist and administrator at the Salachyk cafe, owned by Marlen (Suleiman) Asanov, an activist of association of the political prisoners’ families "Crimean solidarity", who was detained on October 11. Seitumer Seitumerov was taken to the police department of the city of Bakhchysarai. According to the lawyer, an administrative protocol is drawn up under Part 1 of Article 20.3 of the Code of Administrative Offenses of the Russian Federation ("Propaganda or public demonstration of Nazi attributes or symbols, or attributes or symbols similar to Nazi attributes or symbols to the point of confusion, or attributes or symbols of extremist organizations, or other attributes or symbols, propaganda or public demonstration of which are prohibited by federal laws "). The second search took place in Zarechnoye village of Simferopol district in the house of Eldar Kantemirov. Security forces seized his phone and laptop, but the searched Crimean Tatar was not detained. Kantemirov was a participant in solitary pickets on October 14, 2017, after which he was interrogated by "law enforcers". QHA reported that the activist Seitumer Seitumerov, who had been searched today, was taken to the Bakhchysarai police department. 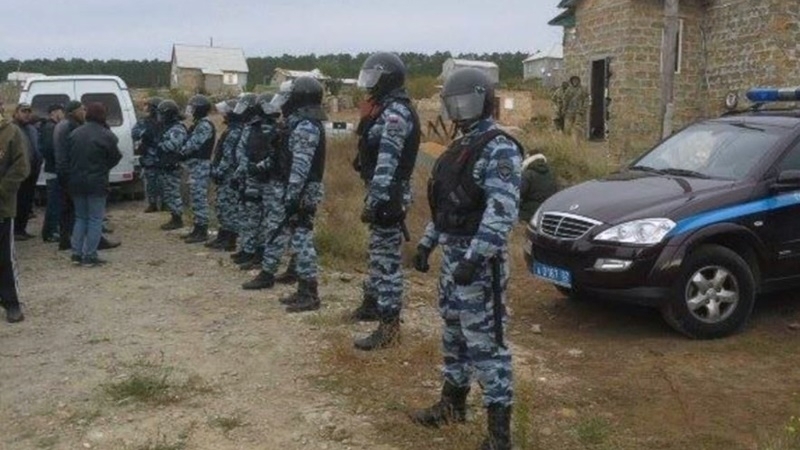 This morning, November 8, in the occupied Crimea, searches were again carried out in the homes of Crimean Tatars. In Bakhchysarai, a search was conducted in the house of a civil activist Seitumer Seitumerov. His lawyer was not allowed to the search in his house in Rechnaya Street. Besides him, the security forces searched the houses of two more Crimean Tatars - Alimdar Belyalov (town of Stary Krym, Krestyanska Street, 11/2) and Eldar Kantemirov (Simferopol district, Zarechnoye settlement).